The Sleeping Indian Guesthouse located in La Fortuna is named after little chain of mountains next to the Arenal Volcano , known by the locals as El Indio Dormido- The Sleeping Indian as it resembles a big fat Indian lying down. 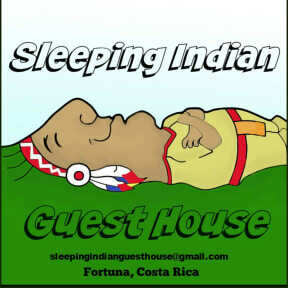 The Sleeping Indian is an international guesthouse with a an owner, Peter Ferguson, who welcomes international travellers from all over the world and is knowledgeable about tours and activities you can experience while visiting the La Fortuna and Arenal Area. The guesthouse is intimately sized with only 5 guest rooms all with private bath and hot shower. With our intimate atmosphere, fully equipped kitchen, our spacious living room and our great hospitality, no matter what kind of traveller you are, you will feel at home straight away. Making you feel at home is what we do best, because we love people, and we love hosting. Continental, breakfast is available, and laundry service is on premises.